World Vision’s long-term presence in thousands of communities means that every day we are confronted with the shocking reality that hundreds of millions of children experience violence, exploitation, abuse and neglect. Their rights to care, protection and to live free from fear are ignored. Our vision is that by 2020 children in the world’s hardest places will live free from exploitation and abuse, in communities where they can flourish. We provide financial and technical support for World Vision programmes that empower children to protect themselves. 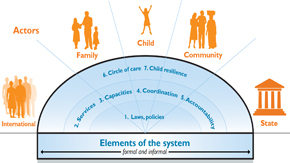 We also work with their families, communities and governments to strengthen the systems (see diagram below) that protect them. Often these children are hidden away, but working closely with the local community we are able to reach these most vulnerable children. In 2013, we supported 26 projects across 17 countries to improve child protection, benefiting 429,987 children living in the world’s hardest places. But making positive changes in the lives of children torn apart by fear, poverty and conflict isn’t something we can do alone. Last year, we worked with thousands of communities to help make children safer and less fearful of violence, early marriage, child labour and abuse. Free from violence: in Somalia, South Sudan, Armenia and Albania, we helped establish child support and protection committees. They’ve helped spot children at risk, and to prevent and report threats. As a result we’re seeing less violence against children, safer schools and better parenting skills. Free from early marriage: we helped communities understand the negative effects that marrying young can cause. Incidents of early marriage have been reduced in 23 communities in Malawi – in six months, local child protection committees assisted eight girls aged 13 to 15 to become free from forced marriage. Free from harmful work: in the brick factories of Battambang and Sangke, Cambodia, child labour is down 59%. Many of these children are now back in school. Awareness of child labour laws has also increased among employers and communities. Free to speak out: after five years of work in Lezha, Albania, more than one in five people surveyed said child protection had improved significantly and almost all believed children were empowered to talk about child protection issues. Free to learn about their rights: in the east of the Democratic Republic of Congo, we trained 130 vulnerable children, including survivors of sexual violence and child soldiers, to know their rights and know where to go to get help. In Albania, we’ve run camps, theatre performances and training sessions to help 499 children understand their own rights. Our impact is measured in the changed lives of individuals. Anika1 and Sarah2 are children that World Vision has helped to empower and stand up for children’s rights. Anika from Bangladesh was at risk of being married off when she was just 14-years-old. She saw many other girls dropping out of school to be married – often into exploitative, violent and risky situations. However, Anika joined a child rights club supported by World Vision and gained the skills and confidence needed to make her community aware of the negative effects of early marriage. Now Anika has joined her voice to those calling for change at a national level and with World Vision’s support has taken her message about the harm that early marriage can cause to the United Nations. In Tanzania, 11-year-old Sarah became aware that a classmate was to be illegally subjected to female circumcision. Having received life skills training from World Vision, Sarah knew this was wrong and that she could do something about it. Sarah spoke with a teacher who referred the matter to community child protection committee, supported by World Vision. The committee then stopped the circumcision. Since then Sarah has trained other children in life skills and also explained the allegation management process to a senior member of the police, which helped to strengthen local child protection systems. The projects represented here were all funded by the UK’s Department for International Development through its Programme Partnership Arrangement (PPA). Their aim is to provide an illustration of some of the child protection challenges communities face, the approaches used to tackle them, the lessons learnt and the plans made for the future. As such, they touch upon various themes of child protection: from tackling harmful traditional practices to addressing gender inequalities or challenging the exclusion of the most vulnerable children.